"In the early 1860s people around the world were reviewing methods of warfare and improvements to how wounded soldiers from all sides were treated. Tauranga Maori were among those pondering the same ideals as notable reformers Henry Dunant and Florence Nightingale. Henare Taratoa... read full description below. 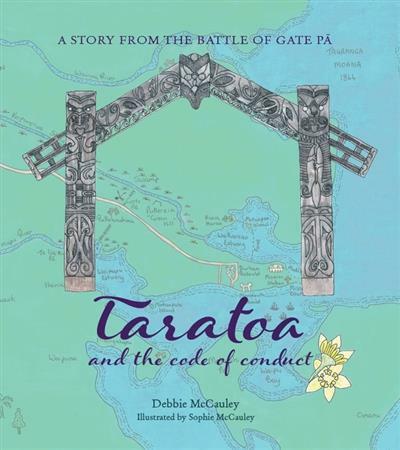 This bilingual children's picture book tells a story from the Battle of Gate Pa at Pukehinahina (29 April 1864) which was a pivotal point in the history of Tauranga Moana. It was illustrated by the author's 15-year-old daughter. In the early 1860s people around the world were reviewing methods of warfare and how to improve the way wounded soldiers from all sides were treated. Prior to the Battle of Gate Pa at Pukehinahina (29 April 1864), Tauranga Maori were pondering the same ideals as notable reformers Henry Dunant and Florence Nightingale. Maori gathered to discuss leader Rawiri Puhirake's ideas about the treatment of wounded in a battle they knew was inevitable. Henare Taratoa, a mission educated lay preacher and teacher, was one of those warriors, and it is he who wrote the Code of Conduct. After the battle British were stunned, not only by their defeat at Gate Pa, but by Maori compassion. Maori chose not to mutilate or kill wounded soldiers, but instead gave water. Seven weeks later the British won the Battle of Te Ranga during which most Tauranga leaders, including Puhirake and Taratoa, were killed. This defeat led to Maori surrender and confiscation of land in Tauranga Moana. This bilingual book tells the story of Taratoa's Code of Conduct and the compassionate actions that resulted. Fact boxes and a timeline are included and add historical detail to Taratoa's story which is commemorated in a chapel at Lichfield Cathedral in England, as well as on a marble frieze at Tauranga's Mission Cemetery. Timeline, fact boxes and maps are included.